For those who seek a clean healthy environment indoors, house plants are an essential element for work and home. People spend an average of 90% of their time indoors. Indoor air quality presents its own challenges since it is generally more polluted then the outdoor air quality. Plants improve the air quality by helping remove the chemicals such as formaldehyde and carbon monoxide. Plants act as the lungs of the indoor environment. Adding indoor plants to the interior setting creates a healthy environment. A 2007 study by the “Center for Health Design” examined the health care environment citing research by Ulrich, states the use of plants indoors reduces stress and promotes overall since of wellbeing. Plants remove carbon from the air and replace it with oxygen. Workers in plant friendly indoor environment’s miss fewer days of work and experience less job stress. Indoor plants help reduce the level of many common indoor air borne impurities of volatile organic compounds (VOCs). These toxins are common cause for sick building syndrome. Indoor plants enhance creative problem solving skills among men and women. When plants are present employees are more satisfied with their jobs and report fewer ailments. 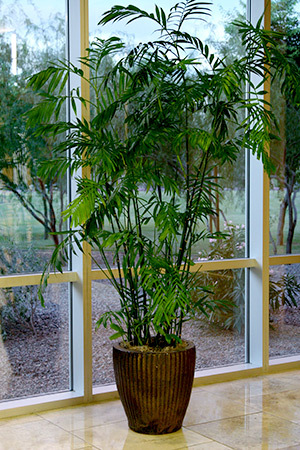 Indoor plants help reduce noise levels, decrease temperatures and lower humidity. Some indoor plants increase positive feelings and reduce stress, fear and anger. Indoor plants are a solid return on investment and a MUST for any corporation concerned with sustainable green building solutions.